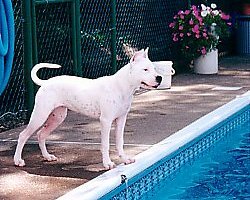 Deaf dog: Annabelle, a Boston Terrier, born bilaterally deaf. 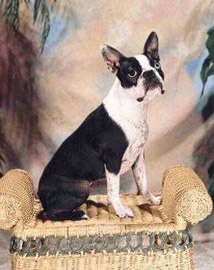 Other pets: Geriatric Boston Terrier, Candy; and cats, Kiki, Smokey & the Bandit. Deaf dog: Logan is a one year old Border Collie. Other pets: Nikki, a 5 year old Siberian Husky; Cleopatra, a 4 year old Husky mix; Piper, a very fat cat. 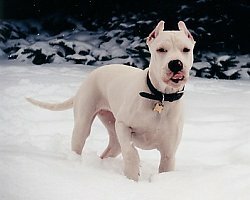 Kylie, a 1 year old Argentine Dogo, "is a good girl and never any trouble even as a puppy. If I didn't tell you she was deaf you would never know." Kobi is a 6 month old Agentine Dogo, who "is full of the devil. She is trouble from the time she gets up till she crashes back to sleep at nite. She tries to beat up my Jack Russell and she doesn't listen at all, but she still has our hearts. Someday she'll be good!" 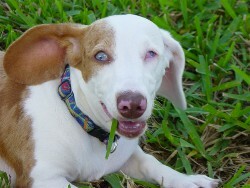 Deaf dog: Marley's human pal writes: "I got my Marley from a friend / breeder of dachshunds. We did not know of her deafness until she was 6 week weeks old, and by that time we knew she was blind in left eye which is also congenital. This little girl is so busy and in to everything you would never know the difference if you met her. She has me trained me well. I could not imagine life without her!! " Deaf dog: Closer to death than life, starved, filthy, matted-coat, fragile, confused and afraid, When my wife first saw this emaciated toy poodle at the local "pound",Sharon saw past the appalling appearance. She saw a beautiful being, with a fierce desire to live and love.A staff member explained the young dog's history. A distraught person who reported the almost constant half bark, half screams of a distressed dog, had called the authorities. When the officials arrived at the empty house they discovered the desperate dog in the bottom of an empty swimming pool, no water, no food and no shade from the southwest Florida Summer sun.This rescued dog had been at the "pound" for one day and the veterinarians were not sure she would survive.At the moment Sharon was introduced to this wonderful animal, the dog wrapped her front legs, as tightly as her weak muscle could, around Sharon's ankle. Two spirits met and bonded in love.With medical care and grooming she was as fresh as a daisy, and so Daisy came home to her new family.Daisy was showered with loving acceptance and patience. During her first visit to a private Vet, the Doc discovered her back knees were malformed. Daisy had a peculiar behavior of walking while holding the top of head tucked down low near the side of her paws. The vet suspected neurological damage.When Daisy did not react to sounds the Vet confirmed our observations of the obvious: Daisy was deaf. The Doc said malnutrition was most likely the cause of her physical challenges.Sharon and I committed to include Daisy into our lives. We sensed Daisy had a great gift to give: the spirit of joyful aliveness.